Gever Tulley is a big-time hero of mine. He did one of the earliest, best Ted Talks: “5 Dangerous Things You Should Let Your Children Do.” He also founded the Tinkering School in San Fran (and elsewhere now, too), where young kids are given power tools and encouragement. Then he and his wife Julie Spiegler wrote “50 Dangerous Things (You Should Let Your Children Do).” And then, in 2011, he went whole hog and founded the Brightworks school in San Fran. I visited that sunny school set in an old Best Foods Mayo factory, and it blew me away. When kids weren’t reading on their own, or writing, or playing, they were building chairs — not clumsy, clunky chairs. Chairs that will last a lifetime and look good. They don’t even wobble. (My local bakery could use some!) The kids seemed as sunny as the space. 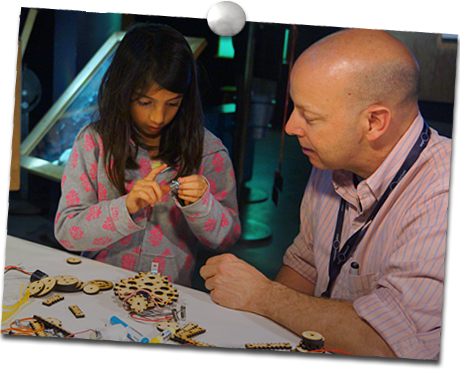 Now Gever has a simple but grand plan to create more tinkerers — kids who don’t distinguish between thinking, playing and problem solving. He just has a little problem of his own he needs solved: A financial boost. So here’s his video. I love it. And here’s where we can contribute. Dear Free-Range Kids: I meet with hundreds of educators and parents a year, and sometimes it seems like the greatest challenge they face when trying to create unscripted learning is figuring out where to start. Well, it took us a while, but I think we’ve finally answered that. We don’t call these items “kits,” we call them “catalysts,” because that’s what they do. They get kids engaged — without scripts or textbooks. Real tinkering, in a box. But the box just gets them started. It’s the ideas and the habits that really matter. Tinkering is a way of engaging your mind, and seeing possibilities everywhere. These boxes open the world. – G.T. Fun and learning should never be considered opposites. These kids are smiling so much, they must be learning a ton. – L.
Gever and a budding tinkerer. This is similar to the Maker kits I have seen. Generate a passion in STEM or creativity. Or Instructables you can find online that list things you can often find in your house, or acquire cheaply in more cases. Much as I like the Legos Mindstorm the price for those is often out of reach, but cheaper kits that give kids some experience with tools is a great thing. If we get a free kit (as I see in the funding), I’ll sign up. I did the same thing when the One Laptop Per Child started, and my kids still play with it and use it 10 years later. What a coincidence – the first box of catalyst for my son arrived and then you post this article! Now, if only parents are ALLOWED to encourage their children to play, create, and venture out on their own. http://tinyurl.com/MeitivUpdate3 Help Gever Tulley and help all parents, too. Isn’t this just what our rulers and bipartisan oppressors in Washington want? They have all the power, crush most opposition, and wouldn’t want their gravy train of foreign corporate money to stop flowing for a minute. In other words, this is a time similar to 1900 or 1932. Sending you to jail for violating even their slightest wish for you to raise your child their way is perfetly in line with this principle. I think the proof of this theory is that your government will send you to prison for a minor transgression that creates negligible “risk” for your child, but it will send them instantly to be killed later, in the latest Vietnam-of-the-Week. Our leaders care about you oh, so much. Perhaps we’re having this problem, because today our government looks at its own citizens as the biggest threat it faces. @Resident Iconoclast You totally nailed it. This is why I am raising my daughter to question authority, even mine. She often teaches me a thing or two! She’ll never be anyone’s lackey, that’s for sure. She’s destined for greatness – which is why we’re moving to a country that encourages entrepreneurship on every level. Israel is the “startup nation” that everyone should keep their eye on, and kids there free range like nobody’s business! When I was a kid, our best toys didn’t come from shrinkwrapped plastic boxes off storeshelves. They came straight out of our active imaginations. The poorest kids in the neighborhood were often the most inventive. A 4X4 sawed off became a baseball bat. Carboard and rubber bands became goalie pads. We decided to take up golf. We made our own golfclubs, and they were a riot. Hmmm. Governmental “tinkering” no doubt. But don’t forget: with the strongest Corporate presence, possible. The way the Government apparently cares not – reflects perfectly, the new Barbarism of modern Corporatism. not as a weapon, no. As a tool of necessity. We home school and one of the things I am trying to do is to get the children into the idea of seeing questions everywhere. I was buttering my toast this morning and overheard a table discussion about gravity. It gave me the idea to ask my son a question “do you think a heavy object will fall slower, faster, or the same as a lighter object” to which my son replied “faster!”. I left him with the challenge of gathering objects and testing his theory while I’m at work today. Sometimes all you need to do is get your children into the mindset that everything is an opportunity to investigate. Love the video BTW, I’ll be sharing it later! Tasha, that is fantastic! I actually remember my mom doing that with me when I was little. One question I had was, will the water level in the glass rise when the ice melts? Since the ice sticks up out of the water, it stands to reason that it when it melts, the water level will rise. My mom told me to test it, and I did, and I remember it to this day! Pretty sure I would not if she had just told me the answer. You mean the lack of it?